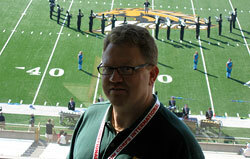 Todd Fox has been judging drum corps and the percussion music caption since 1994, and he is the new Drum Corps International Central Division Judges Coordinator. He served as the chief judge at the DCI Kalamazoo event, and took some time from his schedule to explain the latest changes to the judging system. The DCI Kalmazoo Premier Event was among the first shows this season to utilize a panel of eight judges. As a cost saving measure, Drum Corps International had reduced the number of judges to five for the first two weeks of the season up through July 4. Those five captions consisted of Music Effect, Visual Effect, Music Ensemble, Visual Ensemble and Percussion Performance. While utilizing only five judges was a new experiment, keeping field judges away from the action in the early season is nothing entirely new. "We purposely don't have judges down on the field in the early part of the season when they are least familiar with the music and drill," explained Fox. "It is safer for them and the marchers if they sit in the stands and learn where they should be throughout the programs. The percussion judges benefit by learning where the moments are that give them the best vantage point to view the shows; including elements of musicality, safety and staging." Many may remember that last year the two field judges (Percussion and Visual), while still incorporated as part of the panel, sat in the stands to keep out of the way as corps members continued to learn their programs. Prior to Saturday, each of the five judges had 20 points to work with, which they assigned outright. The scores were added up to determine the final score. Under the eight-judge panel, the two Effect judges have 20 points each, representing a full 40 points. The other three Visual judges, (Color Guard, Ensemble Visual and Field Visual) get 20 points each for a total of 60 possible points. That score is then divided in half. On top of those scores are three music judges – Field Percussion, Ensemble Music and Field Brass – each getting 20 points, which also is divided in half. There is a possible 30 points from the Visual judges, a possible 30 from the Music judges, and 40 from the two Effect judges. Later in the season only at select DCI Premier Events will corps be judged under a nine-judge panel, with a second percussion judge who will also be on the field. That score will be averaged with the other Field Percussion judge to determine the total percussion score. "We keep experimenting with different configurations from year to year as we are constantly looking for the best possible mix of judges to do the job," said Fox. "At the end of the day, our goal is to assist and evaluate the corps as best we can. The directors and members of the judging task force make these decisions with the best interests of the corps in mind." Fox added, "Every year, when it comes down to evaluating the arts, we discuss the 'what' and the 'how' related to doing our jobs in the best possible way. That's why we're continually trying to find the best way to evaluate with the most consistency." Following up on the use of five-judge panels, questionnaires have been sent out to all judges and to the corps to evaluate the system. Those results will be compiled and discussed in two weeks at the Drum Corps International San Antonio Premier Event.